Guava is a tropical fruit roughly the size of a tennis ball. 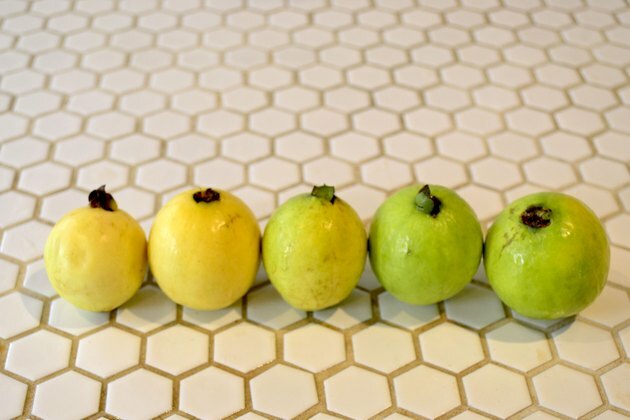 Depending on the variety, the color of a guava is pale green or yellow. When ripe, the flesh of a peeled guava is reddish in color, and the flavor is sweet and refreshing. A whole guava has between 50 and 112 calories, and contains a number of nutrients, including vitamin C, potassium, dietary fiber, vitamin A and folate. Although guavas are available in the U.S. all year, summer is the peak season. 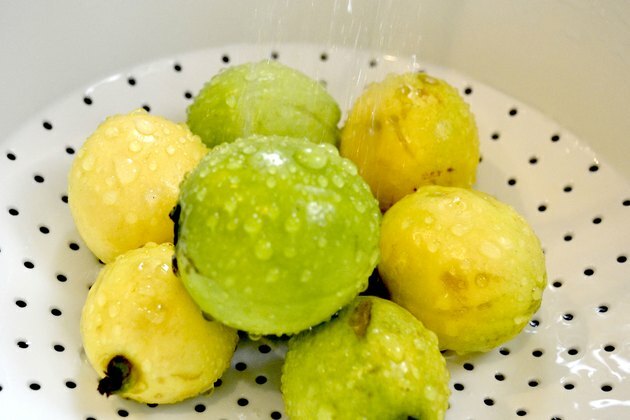 Rinse a guava under cool running water, without soap. Cut out any bruised areas with the tip of a paring knife. 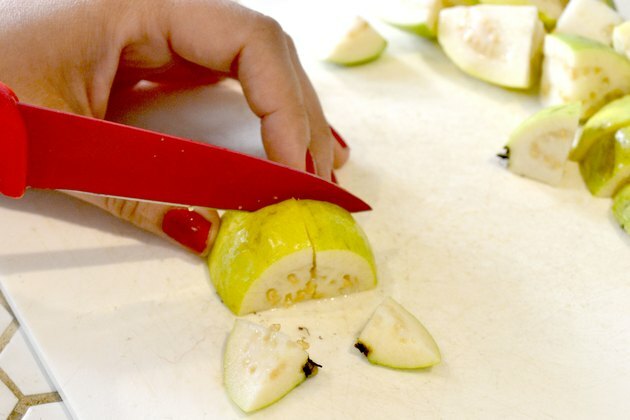 Cut the guava in half crossways. Use a teaspoon to remove seeds from the center of the fruit. The guava is ready to eat. 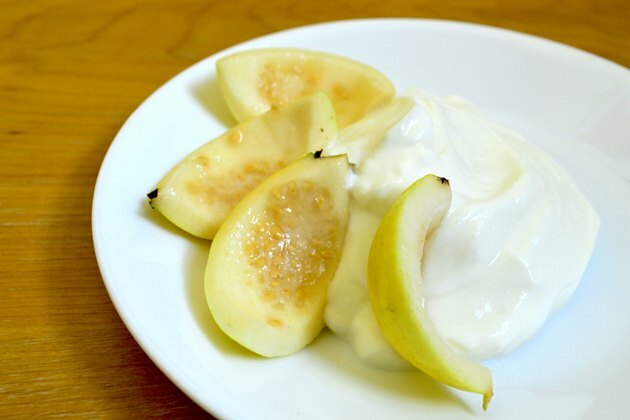 Serve guava with ice cream or yogurt, or cut the guava in chunks and add it to a fruit salad with orange wedges, sliced bananas and other fruit. 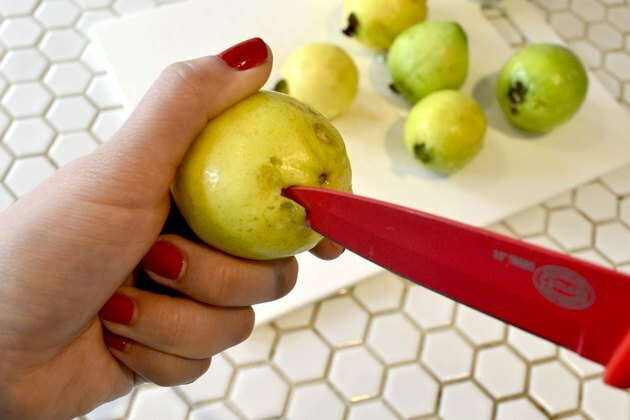 Ripen guavas by placing the fruit on your kitchen counter until it becomes slightly soft. Store ripe guavas in the refrigerator for up to two days. Guava is easy to freeze; slightly tart guavas are best for freezing. Wash, peel and halve the fruit, and spoon out the fiber and seeds. Place the fruit in an airtight container, then cover with a sugar syrup. Place the lid on the container securely and freeze. Frozen guava keeps for about eight months. Guavas are good in a variety of dishes, including pies, puddings, cakes, jam, relish, chutney, marmalade and sauces.